Travel back to New York City for the second time to once again defend the citizens of this city from its horrific criminals. This game is styled just like its predecessor, in a comic book fashion. NetEnt’s Jack Hammer 2 – Fishy Business is presented by 5 reels and 99 paylines that are spread across 3 rows. This game is bursting with outstanding features and a humorous video production to welcome you to the fun that lies ahead. With a max jackpot win of 990,000, it is sure to delight slot fanatics who love this style of theme. It boasts wild symbols, free spins, multipliers and sticky wins. The background maintains the New York City cityscape as seen in the original Jack Hammer slot and takes on a nighttime view of the city where the bad guys prowl and carry out their business. As with the first, it stars the formable Jack Hammer, his arch rival Dr. Wuten, Pearl, and a host of crime-fighting paraphernalia such as a microphone, gun case, wooden barrels, a speedboat, a house by the river, and a couple of thugs. NetEnt continues to provide the great set of betting options for cartoon themed enthusiasts and slot lovers alike they have for years. The minimum wager begins at $0.50, and the option to increase to $$250 per single bet is offered. As this slot requires all lines be active, it provides a range of the same amount. $5.00. The bonus features in Jack Hammer – Fishy Business really is the defining aspect and this game has multiple ones to look forward to including wild symbols, free spins, and sticky wins. Each adds an element of excitement as they fall into position on the reels and begin to help the wins accumulate. When you land a winning combination, a re-spin will activate and spin all reels and provide the chance to increase the win by adding additional winning symbols to other paylines. This continues until no additional winning symbols are stopping in position on a payline, or until all five reels are filled with symbols that resulted in the activating win. The base game wild, which is the symbol with bullet holes and the word Wild displayed across it, will act to substitute all but the free game symbol. It may appear on any reel or multiple reels simultaneously. The Robotic eel, when located on the reels in groups if five to eight, will allow free games to be activated. This will award a minimum of ten free spins, however, if additional free game symbols land n the reels due to the re-spins, it will increase the awarded number of spins to as much as 20. All free spins are joined by a 2x multiplier, and at the beginning of each spin, a wild symbol will randomly be placed on reels 2, 3 or 4 to increase the chances of a winning combination are-spin. 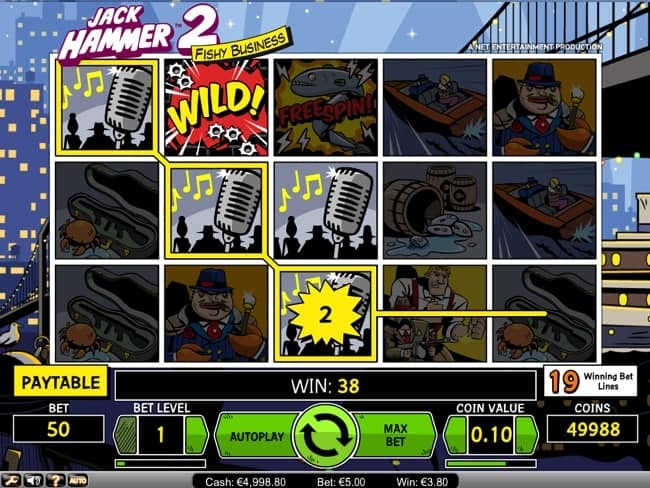 Jack Hammer 2 – Fishy Business gives enthusiasts creative graphics, impressive sound effects, and fabulous bonus features. The addition of a top payout makes traveling this city again well-worth the effort. Indeed, it is presented in an environment that was difficult to forget, and when you consider the re-spin feature and higher than average payouts, it is one medium volatility game that ends up benefiting as payouts are won frequently.